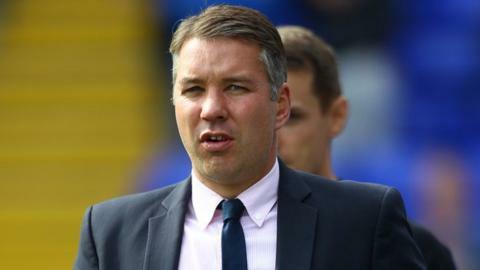 Peterborough United manager Darren Ferguson says he does not like working with the club's director of football Barry Fry. The Posh boss was responding to Fry's comments that Ferguson held talks with representatives of the potential owners of Nottingham Forest over the summer. "I have not spoken to Fry but I do not like working with him," said Ferguson. In a statement Posh said Fry's comments had not been sanctioned by the club and they had taken "appropriate measures". Ferguson, in a statement to the Peterbourgh Evening Telegraph, added: "I have spoken to the chairman about this matter but that conversation will remain private. "For one reason or another [Fry] is a permanent fixture at this club, so I just get on with things. "I suspect he is trying to undermine me with the fans and force me to resign. "If that is the case then he is going to be disappointed. He has tried these underhand tactics before." Forest were eventually who replaced boss Steve Cotterill with Sean O'Driscoll. But Fry says Ferguson held meetings about taking over at the City Ground. "I found that Darren had two meetings and hadn't told my chairman," Fry told BBC Radio Nottingham. Fry described the discussions, which occurred after Ferguson comfortably kept Posh in the Championship last season, as "unsettling" and argued the club missed out on signings as a result. "It was with different people who weren't connected with Forest. It was a bad thing. I'm not blaming Forest," he explained. "Outside sources who were trying to control the club and bring in consortiums to take on the club were talking to our manager about a vacancy that really didn't exist. "That was very unsettling for us at the time because we were trying to sign players. And the players were saying to me, 'I want to sign for Darren Ferguson. If he's not there I'm not signing'. "We lost two or three players on the strength of that. It was a very bad time for us. We were very angry about that. Darren admitted that he had met certain people." Fry added that former QPR chairman Gianni Paladini had played a part in the talks, but as a representative for a consortium interested in buying Forest. "He was involved in the second meeting. He wasn't involved with the first. It wasn't entirely his fault," he said. Ferguson responded by issuing a statement on Monday, saying: "I was contacted by people representing potential new owners of Nottingham Forest and, as they were only potential owners, I had no obligation to speak to my chairman about that. "But the real issue here is why on earth this story has surfaced now. There is no rhyme or reason to drag this up at a time when we are all under enough pressure as it is. "Let me make this clear as well: No player has refused to sign for this club as a result of anything I have ever done. It's his (Fry's) job to sign players, so maybe he is looking for an excuse for his own failings. "I don't like discussing things like this in public but I feel I have to respond on this occasion." Posh have distanced themselves from Fry's comments saying in a statement: "It is always the intention of the board to conduct all football business in a professional and considered manner whereby content is deemed to be beneficial, factual and necessary. "In light of the public exchanges, the club wishes it to be known that at a formal meeting, the situation was discussed with appropriate measures bringing closure to the matter."